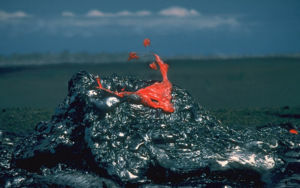 Hornito forming on east rift zone of Kilauea during the Pu`u `O`o-Kupaianaha eruption. A hornito is a small rootless spatter cone that forms on the surface of a basaltic lava flow (usually pahoehoe). A hornito develops when lava is forced up through an opening in the cooled surface of a flow and then accumulates around the opening. Typically, hornitos are steep sided and form conspicuous pinnacles or stacks. They are "rootless" because they are fed by lava from the underlying flow instead of from a deeper magma conduit.